Noninvasive methods to diagnose rejection of renal allografts are unavailable. Mass spectrometry followed by multiple-reaction monitoring provides a unique approach to identify disease-specific urine peptide biomarkers. Here, we performed urine peptidomic analysis of 70 unique samples from 50 renal transplant patients and 20 controls (n = 20), identifying a specific panel of 40 peptides for acute rejection (AR). Peptide sequencing revealed suggestive mechanisms of graft injury with roles for proteolytic degradation of uromodulin (UMOD) and several collagens, including COL1A2 and COL3A1. The 40-peptide panel discriminated AR in training (n = 46) and test (n = 24) sets (area under ROC curve >0.96). Integrative analysis of transcriptional signals from paired renal transplant biopsies, matched with the urine samples, revealed coordinated transcriptional changes for the corresponding genes in addition to dysregulation of extracellular matrix proteins in AR (MMP-7, SERPING1, and TIMP1). Quantitative PCR on an independent set of 34 transplant biopsies with and without AR validated coordinated changes in expression for the corresponding genes in rejection tissue. A six-gene biomarker panel (COL1A2, COL3A1, UMOD, MMP-7, SERPING1, TIMP1) classified AR with high specificity and sensitivity (area under ROC curve = 0.98). These data suggest that changes in collagen remodeling characterize AR and that detection of the corresponding proteolytic degradation products in urine provides a noninvasive diagnostic approach. An additional important confounder for AR diagnosis and management is BK nephritis. To address these issues, this study performed noninvasive, urine peptidomic analysis of 70 unique urine samples, collected from renal transplant patients and controls, by liquid chromatography and mass spectrometry (LC-MS), followed by multiple reaction monitoring (MRM) verification, on five different cohorts, including samples with nonspecific proteinuria, BK nephritis, and vyuria. To explore the relevance of altered urinary peptide abundance, we also performed integrated transcriptomic analysis on matching biopsy microarrays, paired with the urine samples, available in the Sarwal Lab (GEO, GSE14328). Quantitative real-time PCR (Q-PCR) verified significant overlapping genes in an independent set of 34 biopsy samples. Our results indicate that disease-specific alteration of proteolytic and antiproteolytic activities is the underlying mechanism by which these urine peptide biomarkers are generated in graft rejection. To our knowledge, this study represents the first study that analyzed urinary peptidomic and matching renal biopsy transcriptomic analyses, which will help in elucidating the pathophysiological relationships between our nested urine peptide biomarkers and allograft proteolytic networks in vivo in renal allograft diseases. The overall study design for the peptidomic urine analysis is shown in Figure 1. Seventy unique urine samples were analyzed from the following five cohorts: pediatric kidney transplant patients with biopsy-proven acute allograft rejection (AR, n = 20), stable allograft with normal protocol biopsies (STA, n = 20), BK virus nephropathy with vyurina (BK, n = 10), nonspecific proteinuria with native renal disease (biopsy-proven nephrotic syndrome; NS, n = 10), and healthy age-matched volunteers (HC, n = 10). Samples were split into training sets (n = 46) for urine peptide discovery, and test sets (n = 24) (sample demographics in Supplementary Table 1) for urine peptide prediction and verification. Peptidomics approach for biomarker discovery. (A) Schematics for peptidomic analysis of naturally occurring urinary peptides. (B) Study design for the urine peptide biomarker discovery. A total of 20,937 unique peptide peaks with distinct m/z and HPLC fractions were resolved in the 900- to 4000-Da range. Prediction analysis by a nearest shrunken centroid (NSC) algorithm8 was performed, and 6-fold internal crossvalidation analysis led to the discovery of a set of 630 peptide features with the lowest classification error (Supplementary Figure 1). Discriminant class probabilities and Gaussian linear discriminant analysis (LDA) were performed for each sample8 (Supplementary Figure 2) in both sample sets and resulted in misclassification of only 2 of the 24 samples in the test set. To find a predictive biomarker panel of optimal feature number, various classifiers were tested for their spread of distribution and goodness of the separation (Figure 1B and Supplementary Figure 3). 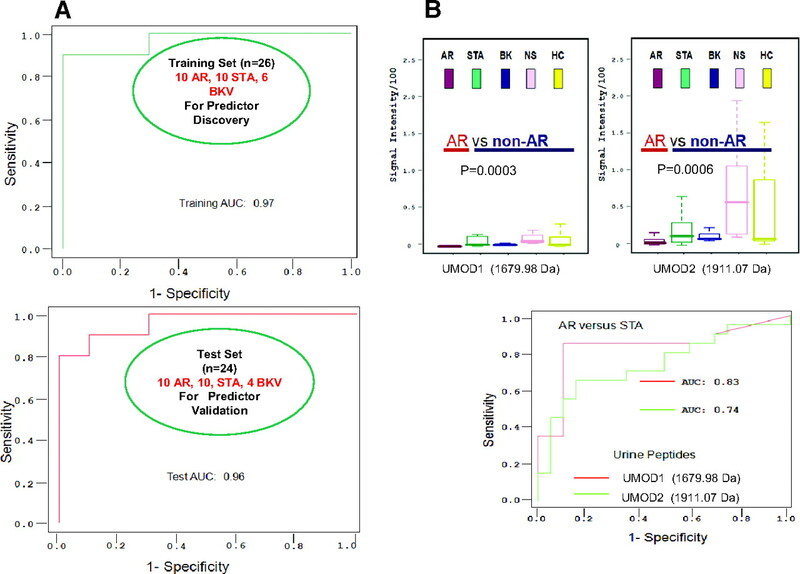 Linear discriminant probabilities of a biomarker panel of 53 peptide peaks was sufficient for goodness of separation of the clinically relevant transplant categories (AR, STA, and BK) in the training and the test sample sets (Figure 2, A and B). This biomarker panel classified the AR samples with 96% overall agreement with clinical diagnosis of AR in the training set (P = 3.2 × 10−6 by Fisher exact test) and 83% agreement with clinical diagnosis of AR in the test set (P = of 0.0027 by Fisher exact test). When all 70 samples were clustered by unsupervised analysis of their peptide abundance across the 53 peak features, all AR samples, save one, co-clustered, and importantly, all of the non-AR samples (STA, BK, NS, and HC) clustered disparate from the AR sample cluster (Figure 2C). Interestingly, the STA samples separated into two clusters, suggesting that STA samples might harbor two subclasses at the urine peptide level. On the basis of the discriminant-analysis-derived prediction scores for each sample, a receiver operating characteristic (ROC) curve was constructed to evaluate the testing performance of our peptide biomarker panel9,10 and resulted in area under the curve (AUC) values of 0.97 and 0.96 for the training and the test set, respectively (Figure 3A). Statistical analyses of the peptide biomarker panel. (A) The discriminant of the peptide biomarker panel for the training (upper) and testing data (lower) probabilities for all transplant samples were calculated from the LDA. The maximum estimated probability for each of the wrongly classified samples is marked with a circle. Two of the 46 samples in the training set and 4 of the 24 samples in the test set were misclassified, giving a correct classification rate of 96% in the training set and 83% in the test set. (B) Left panel: Modified 2 × 2 contingency tables were used to calculate the percentage of classification that agreed with clinical diagnosis for the biomarker panel. P values were calculated with Fisher's exact test. Right panel: A prediction of AR from the non-AR phenotype (a so-called “two-class” prediction) was used to assess the performance of the biomarker panel in the classification of unknown samples. STA and BK were combined into one group as “NON-AR.” Fisher exact test was to compute the P value for the blind test. (C) Unsupervised clustering based on the peptide biomarker panel was used to construct a heat map in which the colors indicate the intensity of peptide concentration by LC-MALDI: red indicates high peptide abundance and green indicates low peptide abundance in the comparative analysis. It can be seen that by unsupervised analysis, the AR samples, save one, all co-cluster together and all of the non-AR samples cluster together. Modified 2 × 2 contingency tables were used to calculate the percentage of unsupervised clustering that agreed with clinical diagnosis for the biomarker panel. P values were calculated with Fisher's exact test. Discovery and verification of AR-specific peptides. (A) Discovery of the 40-peptide biomarker panel and their performance on the training set (top panel) and the test set (bottom panel) using ROC analysis. (B) MRM analyses of the two UMOD peptide biomarkers (top panels). The distribution of MRM signals were analyzed by box-whisker graphs according to the sample categories. The boxes are bound by 75th and 25th percentiles of the data, and the whiskers extend to the minimum and maximum values. ROC analysis (bottom panel) of the classification performance of the two UMOD peptide biomarkers. When ROC analysis was performed to test the diagnostic accuracy of the two UMOD peptide biomarkers for AR, the AUCs were computed as 0.83 for the UMOD 1679.98-Da peptide and 0.74 for the UMOD 1911.07-Da peptide. Mapping of collagen and UMOD peptides in the urine. Identified urine peptide biomarkers yielded clusters of overlapping (A) collagen and (B) UMOD peptides (mass/charge ratio, MH+). “P” in red indicates 4-hydroxyproline. Peptides in brackets derive from the same region of the same precursor proteins. Because the genes labeled in red were significantly regulated in microarray data, we tested them by Q-PCR. (C) Human UMOD precursor. Recent MS analyses50 proved that C-terminal cleavage of the precursor, which has 640 amino acids, occurred after phenylalanine residue 587. Because part of the C-terminal peptide cleaved from the UMOD precursor, the UMOD peptide biomarker cluster (colored in red) discovered in this study spans from serine residue 589, following arginine residue 588, and to lysine residue 607. To verify the presence and quantify differences in peptides between AR and non-AR groups, MRM was performed on two selected peptides14 [UMOD1 (1679.98 Da) and UMOD2 (1911.07 Da); Figure 3] on all 70 samples. The box-whisker graphs in Figure 3B illustrate the spread of the distribution of the MRM measurements in AR (n = 20), STA (n = 20), BK (n = 10), NS (n = 10), and HC (n = 10) sample categories for peptides with UMOD 1680.98 and 1912.07 Da, respectively. 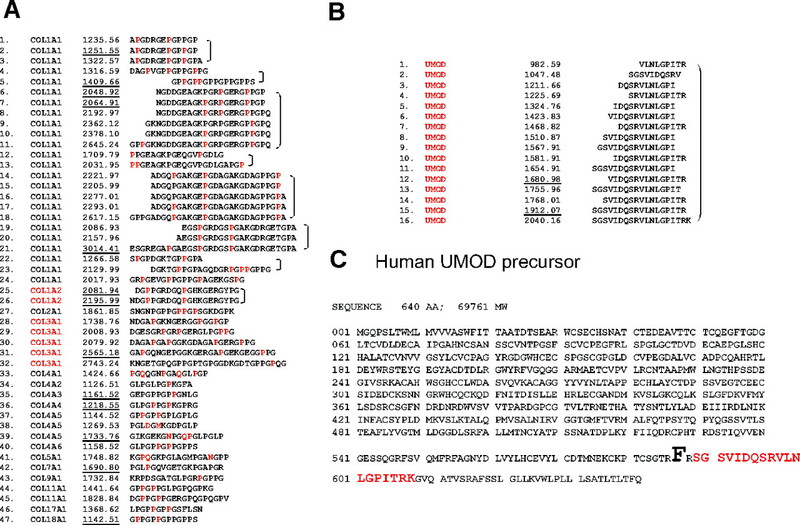 As seen in Figure 3B (upper panel, left-hand side), similar to the results obtained by LC-MALDI, the abundance of UMOD peptide 1679.98 was significantly lower in AR (P = 0.0003), and as seen in Figure 3B (upper panel, right-hand side), the abundance of UMOD 1911 was also significantly lower in AR (P = 0.0006) when compared with all other non-AR categories. ROC analysis to test the diagnostic ability of the two UMOD peptide biomarkers for AR was seen in terms of AUC. AUCs for UMOD1 and UMOD2 were 0.83 and 0.74, respectively. Because urine is an ultrafiltrate of the kidney, we hypothesized that the alteration of the urinary proteins and peptides in urine may relate to processes occurring directly in the kidney. To address this we analyzed archived microarray data in the Sarwal Lab (GSE14328) on matched kidney biopsies (20 AR and 20 STA; taken at the time of urine collection, before any treatment intensification for AR) for expression differences between AR and STA samples for the corresponding UMOD and the collagen genes. We also looked for any expression differences in extracellular matrix proteins in AR, because some of these have been previously demonstrated to be differentially expressed in AR.15 We observed that whereas UMOD gene expression in AR biopsy was significantly lower in AR [false discovery rate (FDR) = 0.02%; similar results to the low UMOD peptide abundance in AR urine], the three collagen genes (COL1A2, FDR = 0.18%; COL3A1, FDR = 0.67%; COL4A1, FDR = 1.82%) were upregulated in AR (different from low collagen peptide abundance in AR urine). Gene expression for matrix metalloproteinase-7 (MMP-7; FDR = 0.03%), tissue inhibitor of metalloproteinase 1 (TIMP1; FDR = 24%), and the serpin peptidase inhibitor (SERPING1; FDR = 33%) was higher in AR when compared with STA biopsies, although only MMP7 expression was significant. We performed Q-PCR in biopsies from a separate set of 34 kidney biopsies (14 AR, 10 STA, and 10 healthy kidney donor biopsies) for UMOD; the most significant collagen genes in rejection, namely COL1A2 and COL3A1; as well as all MMP7, SERPING1, and TIMP1 (Figure 5A). The Q-PCR results validated that the six genes had statistically significant expression differences in AR, with similar results between the microarray and Q-PCR; lower gene expression for UMOD in AR (P = 0.011); and higher gene expression for COL1A2 (P = 0.027), COL3A1 (P = 0.013), MMP7 (P = 0.013), SERPING1 (P = 0.005), and TIMP1 (P = 0.013) in AR when compared with samples without AR (Figure 5A). The importance of these pathways is underscored by the finding that LDA can also use the gene expression values of the six genes in biopsy AR tissue (ROC curve value of 0.98; Figure 5B) to accurately classify a rejection episode similar to the results obtained from analysis of the corresponding urine peptides (Figure 3B, lower panel). Interestingly, irrespective of the confounder of BK virus, biopsy UMOD gene expression and urinary peptide abundance are significantly lower in AR, whereas biopsy collagen gene expression is significantly higher in AR and collagen peptide abundance in rejecting urine is significantly lower. The dysregulation of collagen expression in the rejecting graft and altered proteolysis of collagens in the urine may provide novel insight into the cascade of events that prime a graft for chronic injury and fibrosis after an AR episode (Figure 6). A gene panel specific for AR. (A) The distribution of COL1A2, COL3A1, MMP-7, SERPING1, TIMP1, and UMOD genes' Q-PCR measurements in kidney biopsy were analyzed by box-whisker graphs. (B) ROC analysis was performed to evaluate the performance of the six-member RNA biomarker panel classifying AR from STA. The plotted ROC curve is the vertical average of the 500 bootstrapping runs, and the boxes and whiskers plot the vertical spread around the average. A proposed mechanism of fibrosis caused by AR as indicated by the observations of increased collagen gene transcription in the rejection biopsy and reduced collagen peptides in the urine during graft rejection. Proteomic and peptidomic analysis of urine collected from healthy individuals (22 mg peptides in urine per day)16and patients with renal disease have identified more than 1500 different proteins11,17,18 and over 100,000 different peptide biomarkers19 in health and disease.20 This is the first study of an integrated analysis of the urine peptidome and the biopsy transcriptome in graft rejection that uncovers that overlapping key gene and peptide pathways can be jointly dysregulated in AR. The resultant alterations in the abundance of selected genes and the peptide products of the corresponding proteins can highlight potential mechanisms of graft injury in rejection. Disease-specific alterations of gene transcription in the tissue (by array and Q-PCR) and a change in the balance of proteolytic and antiproteolytic activities in urine appear to be important mechanisms resulting in an altered pattern of a specific panel of urinary peptides in AR. In conclusion, the analysis of the naturally occurring urinary peptides using the LC-MS method in kidney transplant rejection is a novel approach because it provides AR injury-specific peptide biomarkers and also highlights local injury mechanisms in the inflamed tissue relating to a cascade of collagen proteins, which may be important harbingers of chronic graft injury. Future prospective studies of these urine peptide biomarkers by antibody-based or quantitative MS-based approaches are needed to optimize this approach for clinical application and to test the validity of these urinary peptides for prediction of acute and chronic graft injury. Seventy unique urine samples from 50 pediatric renal transplant recipients (20 biopsy-proven AR, 20 STA, 10 BK), 10 age-matched healthy controls (HC), and 10 pediatric patients with nonspecific proteinuria from native renal disease due to nephrotic syndrome (NS; to control for nonspecific renal injury) were collected at Lucile Packard Children's Hospital at Stanford University from 2004 to 2006. Details on patient age, gender, and other transplantation-related clinical indicators are given in Supplementary Table 1. Informed consent was obtained from all patients and the Stanford University Institutional Review Board approved the study. Affymetirx HU133 plus 2 GeneChips on matched kidney transplant biopsies (20 AR and 20 STA) have been previously performed in the Sarwal Lab (National Center for Biotechnology Information GEO database GSE14328). Raw expression data were preprocessed and normalized using dChip software.48 Supervised, two-class unpaired Significance Analysis of Microarray49 analyses were applied to calculate FDR for differences in expression of the corresponding UMOD and the collagen genes in rejection. Additionally, we searched for any differences in the expression of extracellular matrix proteins (TIMP1, SERPING1, and MMP-7) in the rejecting graft. Total RNA was extracted from kidney biopsy samples using TRIzol reagent (Invitrogen Corporation, Carlsbad, CA) and later was DnaseI treated and purified using the RNeasy mini kit according to the manufacturer's protocol (Qiagen, Valencia, CA). cDNA was synthesized from 250 ng of RNA using the RT2 First Strand Kit (SABioscience Corporation, Frederick, MD). Q-PCR reactions were performed on 5 ng of cDNA using RT2 SYBR Green/ROX PCR master mix and commercially available primers: PPH12000A-200 for UMOD, PPH00771A-200 for TIMP1, PPH18747E-200 for SERPING1, PPH00809E-200 for MMP-7, PPH01918B-200 for COL1A2, PPH00439E-200 for COL3A1, PPH20687A-200 for COL4A1, and PPH05666E-200 for 18S rRNA (SuperArray Bioscience Corporation, Frederick, MD). All RNA samples were analyzed in duplicate and normalized relative to 18S rRNA levels. The work was supported by National Institutes of Health grant RO1-AI-061739 (M.S. ), the Deans Fellowship, and the Child Health Research Program (TS, MS). The authors thank Karolina Krasinska at the Stanford University Mass Spectrometry Center for the MRM assay development and applications, Tonya Pekar at Thermo for LTQ Orbitrap MS, and the Stanford University IT group for excellence in Linux cluster support. X.L. and T.S. contributed equally as first authors. J.S. and M.S. contributed equally as senior authors.